Exactly as the name suggests- Gel which gives you energy! Ordinarily of course, food gives us energy, but it needs breaking down and digesting: you can't munch through a bag of chips while you're running a marathon or hunkering down over the bars, and then just expect a burst of instant energy! During sustained, strenuous activity, if you need extra energy, then it needs to be in a form which the body can quickly and easily access, without having to go through process of eating and digesting a meal. 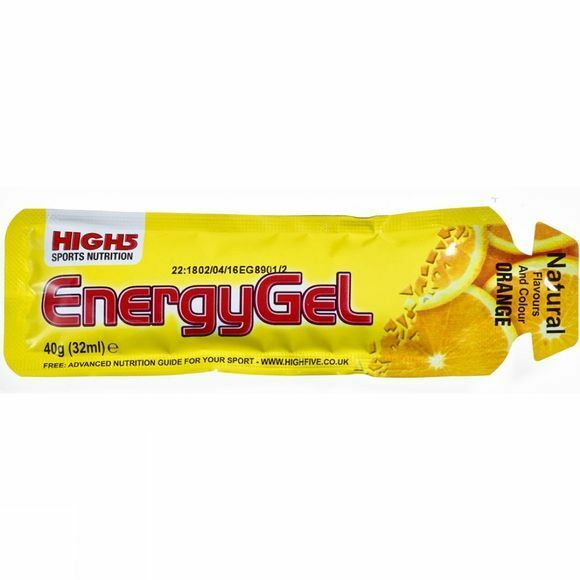 High5 Energy Gel is race proven in the World's toughest events, is light to carry, easy to open and swallow, is flavoured with natural fruits for a light and refreshing taste. Most importantly it effectively delivers carbohydrates to your body to keep the energy pumping. Glucose, water, maltodextrin, fruit juice (orange, lemon), acidity regulator (tri sodium citrate, citric acid), sea salt, preservatives (potassium sorbate, sodium benzoate), natural flavouring.